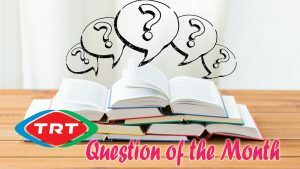 Voice of Turkey – TRT Urdu September 2018 question of the month announced at the beginning of the month. As like as many countries August is a historic day also for Turkey. September 2018 quiz focused on it. Listeners have to choose the right answer from the given three option and send it to TRT Urdu by 30 September 2018. TRT is the National Radio and Television of Turkey. It is an international Service of Turkish state radio on SW. Urdu service of TRT has a monthly quiz show named, “Question of the Month”. TRT Urdu June 2018 Question of the Month is on Turkish Super League. TRT, the Voice of Turkey Urdu service has a regular quiz show called Quiz of the month. TRT May 2018 , Urdu quiz of the month focused on a historic event of Turkey. From the beginning this event organized by TRT, the National Radio and Television of Turkey on April 23.